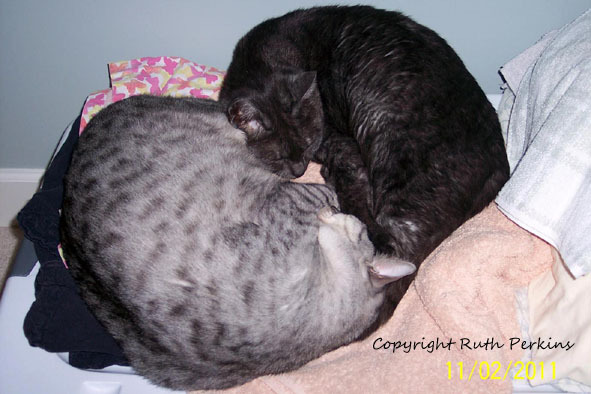 Living With Egyptian cats - What is a Mau like? What is a Mau Like? 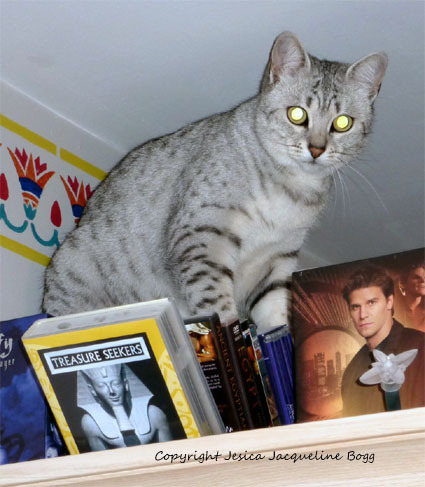 My first meeting with Egyptian cats was when I peered under the bed of a friend and a worried-looking Mau looked back. My friends's mother had become ill and unable to take care of him, and so she had taken him in while searching for a new home for him (yes, he did end up in a family with experience of cats which is good as he was an elderly cat already). I was told he was actually the very first Mau ever to have come to Finland, imported from USA. Only after him did others here start breeding these beautiful Egyptian cats. 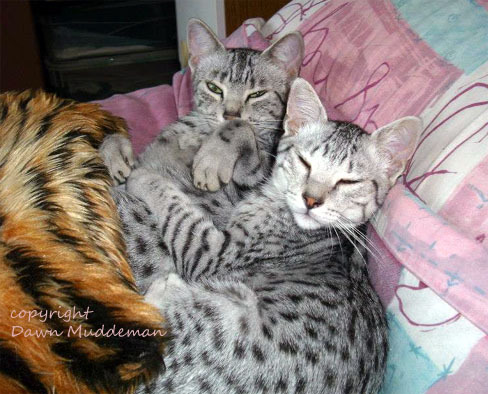 The Egyptian Mau is a breed apart… It is a rare breed with only a few thousand Maus around the world, but it is much loved. It is a well known fact in Mau circles that if you get one Mau, you soon want to get another. They steal your heart. These Egyptian cats are friendly, and fiercely loyal to their families. You could say they are so addicted to their humans they are almost possessive of them. They have a delightful personality, because they absolutely thrive on human companionship and love to interact with their humans. Do they take just one member of the family or the whole family as their "soul mates", varies depending on the individual cat. Once the bond is made, the Mau follows you around like a dog, participating in every aspect of your life. Its delight in seeing you is also almost dog-like - your Mau will greet you at the door when you come home, talking about its day's events to you from the moment you step inside - and it wags its tail too. Well, perhaps not exactly like a dog, but when happy, the Mau will wiggle and twitch its tail with great speed and at the same time tread with its forepaws and chortle in a soft voice. Usually cat owners see this tail-wiggling when other cat breeds spray to mark their territory, but Mau does no such thing. It is just a sign of happiness and you should be proud of yourself if the Mau shows this sign of affection to you. Be prepared to have an ever-present Mau shadow with you where ever you go. These Egyptian cats will seek your company even when they cannot see you (a rare thing to happen, but you will hear them behind the closed door if you are impolite enough to try to hide from your Mau). They are sociable and tender, yet somehow you don't feel they are clingy. But when they want attention, there is no saying no. 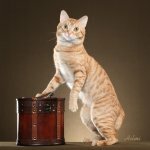 These Egyptian cats are an extremely intelligent cat breed as many original cat breeds are - or else they would not have survived in the wild. With a Mau around you feel you almost have a mind-reader with you - they observe you keenly and develop what could be called as symbiosis with you , sometimes almost knowing what you are up to even before you do. Mau people say that no other breed of cat bonds this closely with their purrsons. Can a cat be left- or right-pawed? Actually the answer is yes. And it is said a greater percentage of cats is left-pawed than the percentage of left-handed humans. These Egyptian cats are wary of strangers and prefer to observe them from afar - or hide from them if the strangers are very noisy or otherwise unpleasant. They adapt slowly even to the more amicable strangers too. This probably gives them the reputation of being a shy cat breed. But they are very protective of their family - both humans and pets included. They may surprise you in situations where they feel their family's safety is at risk - they may rather face the danger than run from it. Usually, though, these Egyptian cats prefer to be adored by their own family only. Ever wonder if it is normal for a cat to sleep all day? (Well, if you have owned cats for any length of time, this behavior should not suprise you) As cats are basically noctural animals, they gather their strength for their night-time hunting. Living indoors the cats do adapt to the human sleep-cycle (more or less), but if you let your cat out, you know it often wishes to go out in the evening and return in the morning. And yes - then sleep all day. 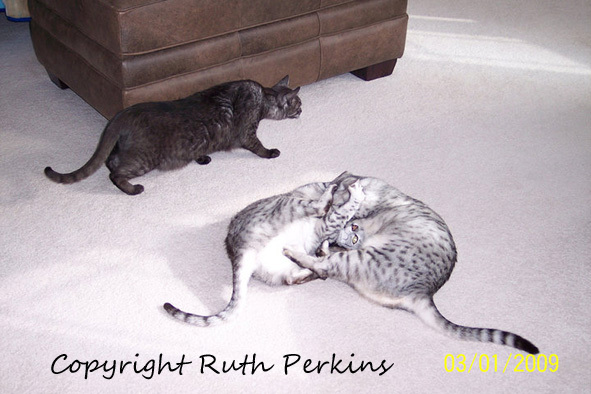 The Egyptian Mau cats have a sweet and musical voice, and they are not a noisy cat breed. They are known by their unusual chortle-like vocalising. 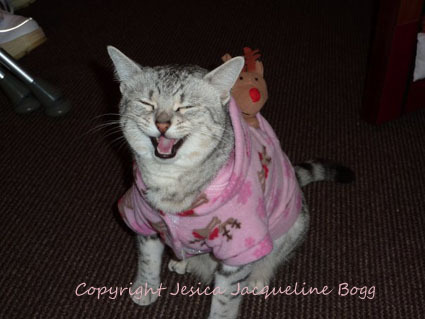 If they are very exited, this chortling might make you think you had a bird in the house because they really do chirp more than meow. If you own a Mau (or rather: the other way around), you sure are witnessing cat life on a fast track… Namely this is the fastest domestic cat in the world. This Egyptian cat is so fast their prey has no chance. It has been nicknamed the Greyhound of the cat world - or what do you think when you hear that they have been clocked to run over 36 mph (58 km/h)? Yes, that is FAST. Just to give you some comparison, giraffes also run at 36 mph. Egyptian Maus have long hind legs and a special "flap" - very loose skin at the front of the back leg thighs, almost like wings. (Some breeding lines have less of a flap, but this is a highly desirable trait). The skin may be so loose as to hide the lower legs when the cat sits on its haunches. And it also allows the hind legs to stretch back unhindered, which of course allows for longer strides and faster speed. These Egyptian cats have an extraordinary power of scent, sight and hearing - a legacy of their hunter ancestry. The slightest little noise sends them exploring. And so sudden loud noises may scare them. They are formidable hunters - it is said they have the fastest reflexes of all domestic cats. If you had a rodent problem, you would want to have a Mau. You will see its hunter ancestry in the fact that the Mau just loves to stalk - any toy or object will do as a target. So don't leave your jewelry, watches, keys, socks, coffee cups etc lying around. Also when you get your Mau kitten, let them practice attacking and scratching - this means getting toys for them so they can hunt and "kill". And of course you will find your Mau "window-hunting" - you will hear the hunt-chatter from the window sill when a bird flies by. All in all Maus are good with children as they love to play, yet have quite an event temperament. But as any kitten, they are fragile when young. So if you have young children that are not likely to handle your kitten with great care, wait a few years. If your children are used to cats already, then no problem. Maus get along with other pets well, but as they are territorial, there will be some "discussion" between them who is the boss. This discussion may require gradually introducing the animals to each other. Once this is settled, these Egyptian cats will live harmoniously with their animal family members too - after all they love company. 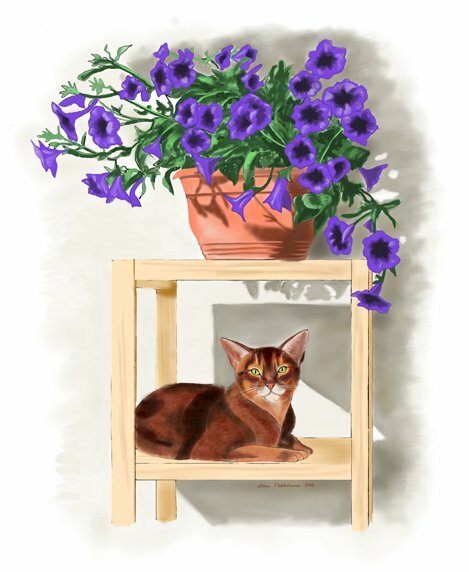 Below is a little video of my friend Jesica's lovely Mau Qetesh (whose portrait you can see on the upper right hand side of this page) and just as cute red Aby Petrie. But as the Mau loves to perch high, perch it will no matter how you try to stop it, so don't even try. It will observe its kingdom and you, its subject, on top of cupboards, doors, fridges… No point in trying to stop it, as every self respecting cat has the obligation to scout the upper levels of the rooms to see there are no hidden dangers or treats up there. Oh, and be prepared that your Mau might consider your shoulders as the perfect perch - and you may be given the honor of carrying your Mau highness around for a tour around the kingdom. Be proud of this sign of trust and don't wear anything that doesn't tolerate cat claws (your skin gets use to this pretty fast). 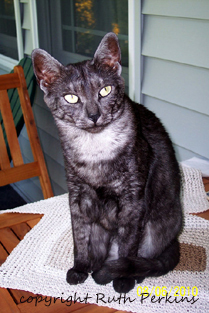 The Mau is a moderately active breed, but not hyperactive. Still, it needs exercies, especially because it loves to be at home at dinner time. These Egyptian cats can easily become obese, especially if they have been neutered - again a trait deriving from their days in the wild. Food had to be eaten where there was something to eat, because there was no knowing when the next dinner came along. 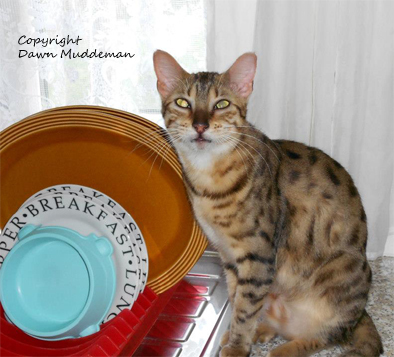 So if you leave food on the plate for your Mau to nibble on during the day, it won't nibble. It gobbles. So unlimited food is not a wise option. The Mau feels no need to watch its lines, so you have to do it or else you might end up with a spotted balloon - and trust me, when it comes to dieting a Mau, there will be a serious clash of wills and this is one stubborn cat... In all likelihood it wins. Obesity causes severe health problems to your cat. So give your Mau a chance to exercise and play with it a lot. One fun game is fetching -they usually learn it easily. Throw a little toy or feather stick and they will trot it back to you and wait for you to throw it again. And again. And again. You only need to worry how to explain to your doctor how you got a tennis elbow from playing with your cat. Why do cats like catnip? It is the oil in the plant's leaves (nepetalactone) that causes the cat to behave in a funny way. It is not addictive to cats so there should be no danger in giving your cat some catnip. You can even grow your own catnip (if you cat lets it grow in peace, that is). This is a breed that may require some teaching to learn that having fun should not be aggressive. This doesn't mean they get angry, but they have a tendency of getting over-exited when they are having fun. This, combined with the fact they can be quite possessive of their toys - being territotiral again - and have super-fast reflexes means you'll probably end up with some scratches no matter how careful you are (oh well, our Aby boy Hippu is also superfast and every time we play I end up with at least one nick in my hands). All this of course stems from Egyptian cats hunter instinct. The earlier Maus showed this personality much more, but now their temperament has mellowed considerably, as temperament has been an important factor in their breeding programs. Of course in the past eating a lot was compensated by exercising a lot - by hunting for new food. And these Egyptian cats love to hunt and of course try to sneak outdoors. Now even though a Mau has very fast reflexes, it is still dangerous for it to be in areas with cars, and natural predators - not to mention people who might think it is a stray and take it for themselves - these are very beautiful cats, so the temptation may rise… So it might be wisest to have your Mau microchipped. Also you might consider taking your Mau out on a leash (just remember regular wormings in this case too). But as this is not a lap-cat it might be a cat breed that is best for families that have some experience with cats and cat-language already. This is not to say a Mau could not be a first-ever cat to a family, if the family in question is well adviced beforehand what characters these Egyptian cats are, how to treat them and how not to treat them. A Mau will bond with its family very strongly, and usually forgives a lot from its loved ones. And as you can imagine, Egyptian cats have been used to very warm temperatures and so the Maus are more sensitive to cold than most cat breeds. They love warmth and should be kept warm. Having been owned by Abys, the other breed said to come from Egypt, I know what this means. We had a sauna in the past and when it was warming up, we knew exactly where to find our Abys - they were melting in the sauna in utter bliss, eyes closed and tails lolling like jelly… Now that the sauna is a thing of the past, the cats seek sun spots, radiators, and of course our little fireplace. When we put the fire on, quicker than you say "cat" our kitties have appeared out of thin air to occupy the very arm chairs we were going to sit by the fire. And they even dare to stretch their toes towards the fire…Life with cats, sigh… This is what you can expect from Eyptian cats. There are stories of Egyptian cats that love water, but this is an individual thing. Some Maus have even gone to shower with their owners, and some just aren't all that interested in splashing around. So if you happen to have a Mau that doesn't like water but does need washing, you should be well prepared for it (gloves are a good thing). Some of the Maus are interested in water as long as it is on their terms, but object mightily if a human tries to force them into water. Maus often test the water first with their paw before drinking it. One theory is that in the wild they tried to hide their scent from predators by urinating into the water - I have never heard of a cat that would do that, but then again one never knows. (I think the Egyptian cats touch the water first like other cat breeds - to break the surface of it so that the cat sees where it is). Remember to de-worm your cat on a regular basis if it is let out, even if it is only on leash. It is more thank likely that it gets a worms or parasites at some point when outdoors. Regular vet-checks are also important. Another sign of the wild origins of these Egyptian cats is that they are more sensitive to modern medication that other cat breeds. This means that pesticides, vaccines and especially antibiotics "bite" it much more strongly than ordinary cats. These Egyptian cats also have much higher sensitivity to anesthesia than other cat breeds. So be on the safe side and mention this to your vet if you take your Mau to be treated - even if they should know this already. Even if you risk being labeled as an annoying customer, it is better to be safe than sorry. But, as this is quite a healthy breed, thanks to selective breeding, you should not meet such situations too often. The Mau doesn't shed much hair, so not much grooming is required. Still, Mau's love being brushed, so you just might do that to please them (be careful they don't learn to fetch their brush - if they do there is no pretending you can't see your Mau wants to be groomed). You can also use a grooming glove to make their coat shine, or something as simple as a stocking around your hand - stroking the cat with it will remove lot of loose hair. Occasional nail clipping is also a good thing to do. Check the ears regularly and clean the outer ears with a soft tissue if necessary (do not start digging deeper). If the ears are very dirty or smell bad, contact the vet - it might be infection or mites. The average life expectancy of these Egyptian cats is around 15 years but with good care they can live a lot longer. So in all likelihood you will have your wonderful, devoted, amusing companion for many happy years. Thank you, Dawn Muddeman, Ruth Perkins and Jesica Bogg for allowing me to use the photos of your beautiful Maus in this article. I want to thank Jesica Bogg, Dawn Muddeman and Ruth Perkins for their kind permission to use their photos to illustrate this article. Do You Have a Beautiful Mau? Do you have a beautiful Mau? Do tell us about your cat and show some photos too! 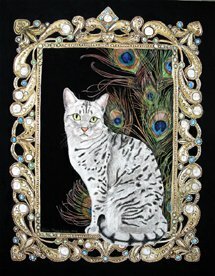 Above is a painting of a silver Egyptian Mau Qetesh. If you wish to see the painting in more detail and read Qetesh's story, click on on the picture or HERE. Do you need to leave your cat alone overnight? (I know, we shouldn't, but life brings surprised and sometimes there is no othe option). Or does your cat wake you up early in the morning, wanting food? Try a food bowl with a timer that opens the lid at a set time. I bought one for our cats and they learned how it works at first try. Really handy to make sure your cat gets food when it needs it - and you get some sleep.